This week marked an exciting and debate-worthy turning point in the relationship between the United States and Cuba, as Barack Obama became the first US president to visit the island nationsince Calvin Coolidge did so in 1928. The Atlantic has an interesting piece  which unpacks prominent Cuban blogger (and Castro critic) Yoani Sánchez’s take on the trip  (English translation here ). 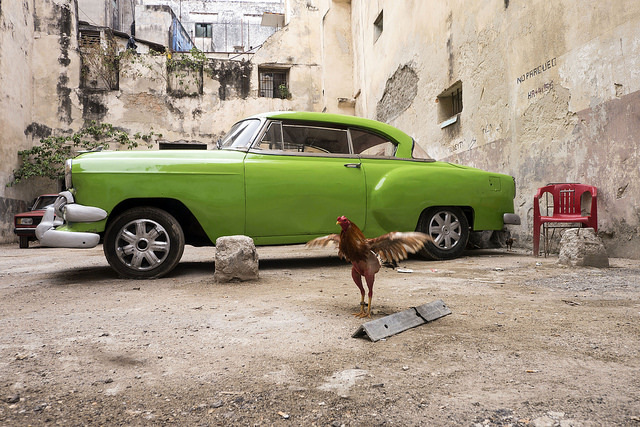 Also worth a look is this excellent photo essay from The New York Times  that examines the vibrancy of life in Havana under Communist rule. After China’s provocations near Indonesia’s Natuna Islands this week—claimed as part of Indonesia’s EEZ—there’s been plenty of interesting analysis about the archipelagic nation’s next moves. Natalie Sambhi discusses Indonesia’s possible responses to Chinese behavior over at War on the Rocks , while Aaron Connelly asks whether an agitated Indonesia might take the helm in an ASEAN response to the South China Sea at CSIS’s Asia Maritime Transparency Initiative . And if these don’t sate your appetite, watch Sambhi’s interview with Connelly over at Bloggingheads (37 mins) which takes a broader look at US involvement in Southeast Asia, as well as Indonesia’s dilemma. A powerful piece over at The New York Review of Books considers the political and cultural climate being fostered in Israel today . It judges that, ‘Israeli peace activists have graduated from being protesters, in theory, at least, protected by the law, to being dissidents—that is, legitimate targets for government-inspired attacks.’ From the demolition of Palestinian homes and the banning of books through to the occupation of territories and enhanced interrogation methods, the piece paints a bleak picture with some tough facts and tougher judgments. The Centre for a New American Security this week released a report that comes down in favour of creating a Maritime Domain Awareness network in the South China Sea. The authors argue that bringing transparency to the region would do much to reduce the chance of conflict in what is an increasingly contested operating environment. Read more here . In this week’s installment of the Foreign Policy E.R. podcast series , David Rothkopf, Yochi Dreazen, Kori Schake and The New York Times’ David Sanger sit down to discuss the timing of President Obama’s trip to Cuba, and whether it has set a precedent for the US’s relations with the rest of Latin America (39 mins). If you have an interest in energy security, then CSIS’ interview with Ken Koyama  (29 mins), the Chief Economist at Japan’s Institute of Energy Economics, should definitely be on your list. Guy Caruso, senior adviser at the CSIS Energy and National Security Program, discusses nuclear energy and the impact of advanced energy technologies on climate change and more with Koyama. Coming just before Airforce One was wheels up for Havana, Obama’s National Security Advisor Susan Rice delivered a keynote on the Administration’s policy approach to the Western Hemisphere. Footage from the event, organised by a handful of think tank heavyweights on the east coast, is available over at YouTube  (34 mins). Canberra: The Strategic and Defence Studies Centre at the ANU will soon host an all-star line-up to examine some critical questions concerning Chinese strategy, foreign affairs and international security. Get along to their public forum on Wednesday 6 April . Amelia Long is an editor of The Strategist. David Lang is an analyst at ASPI and managing editor of The Strategist.